Fig. 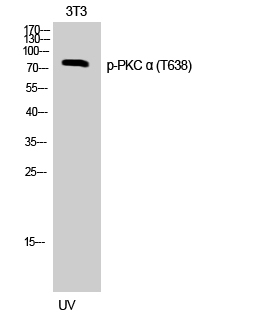 Western Blot analysis of 3T3 cells using Phospho-PKC α (T638) Polyclonal Antibody. Protein kinase C (PKC) is a family of serine- and threonine-specific protein kinases that can be activated by calcium and the second messenger diacylglycerol. 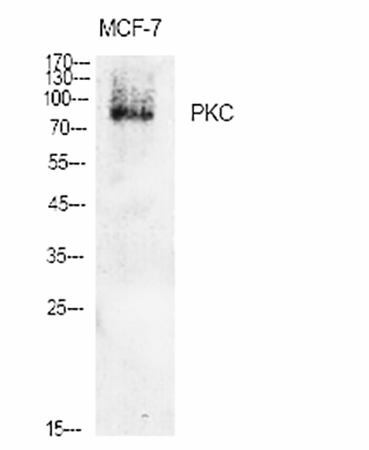 PKC family members phosphorylate a wide variety of protein targets and are known to be involved in diverse cellular signaling pathways. PKC family members also serve as major receptors for phorbol esters, a class of tumor promoters. 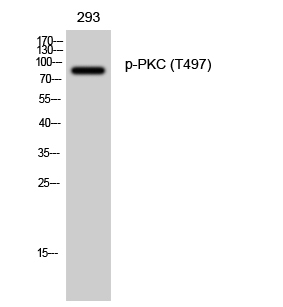 Each member of the PKC family has a specific expression profile and is believed to play a distinct role in cells. 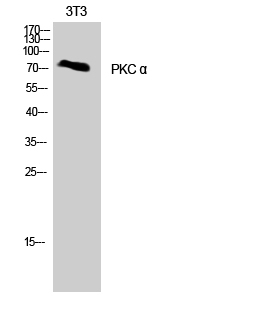 The protein encoded by PRKCA (protein kinase C alpha) is one of the PKC family members. This kinase has been reported to play roles in many different cellular processes, such as cell adhesion, cell transformation, cell cycle checkpoint, and cell volume control. Knockout studies in mice suggest that this kinase may be a fundamental regulator of cardiac contractility and Ca(2+) handling in myocytes. Phospho-PKC α (T638) Polyclonal Antibody detects endogenous levels of PKC α protein only when phosphorylated at T638.